Inventory We are a resale marketplace, not a box office or venue. Ticket prices may exceed face value. This site is not owned by Mohegan Sun Arena . The Mohegan Sun Arena has been one of the hottest spots for central Conneticut entertainment for years. Brining the biggest concert names to a mid sized venue for a great and loyal following. Some of the more notable acts that have graced The Mohegan Sun Arena are Bruce Springsteen, Bon Jovi, The Black Eyed Peas, Elton John and many more. With all of the crowds rushing to the casinos at the Mohegan Sun they have to provide a top notch entertainment facility and they have been very successful. 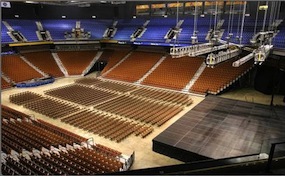 The MoheganSun.ArenaUncasville.com is a privately held company that specializes in the sale of tickets in the secondary market. We are not affiliated with any official supplier or box office. To purchase tickets to any Mohegan Sun Arena in Uncasville events simply call our operators at anytime or click on the event you wish to attend.